First edition. Small octavo (6 3/4" x 4 1/2"). Frontispiece by FAW of woman making Rose Leaf Jam and vignette on title of "The Oven Bird of South America." 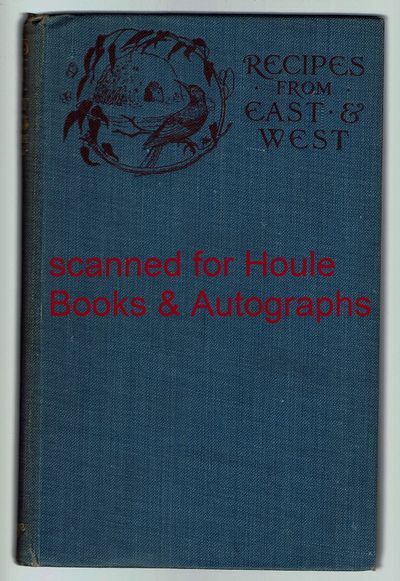 Original blue cloth with gilt stamped spine, cover stamped in red, t.e.g. No dust jacket. Very good. 141 pages + 2 pages ads for "Household Books" and "Struwwelpeter Series of Nursery Books." Bookplate of G. E. Mackenzie Skues and bold ink signature of E. C. Goldsmith. Printed by William Brendon and Son, Ltd., Plymouth. Pages 129-134 A few Beverages and Liqueurs including Sloe Gin, Cassis, Russian Punch, Benedictine, Swiss Absinthe, Curacoa. 2699 N. Palm Canyon Dr.